when it is most burdened. " wave their fingers, and beguile! palm of his hand. " How many kinds of palm trees are there? They aren't all coconut are they? Erasers are only good if you have regrets you know. Loved my time among the palms while I was in Florida. Palms are so tropical, where plants and trees grow so lush and colorful. There's for places where nature has given a bounty of colorfulness. No erasers available for real life; regrets are a waste of time. Lovely pictures of palms. I have always like palms. "Life is the art of drawing without an eraser." - so true. 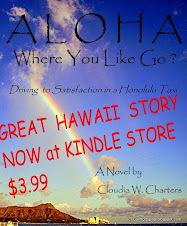 Aloha, Cloudia, sometimes I wish I could go back and use an eraser! I love the dancing palm trees. Lovely images and quotes. Have a happy day! Oh yes, your first two quotes so true, and what one must strive for, every single day. Lovely captures too. I very much like the colours in the first photo. Wonderful John W. Gardner quote. So would you say it's palmy where it's balmy? I loved the shot with the hand of the gardener. Palms and poinsettias.. a heady combination mon amie! Life is drawing without an eraser. Indeed. Palms swaying in the breeze - no need to erase that, Cloudia! They're such lovely trees, Cloudia! I shall be looking at palm trees in a different way now. I love the quotes and the photos - the first photo in particular, your banner and the use of vignette. Life is the art of drawing without an eraser... WOW!! I have to remember that one. A great quote.